Kaoola Spring Water is a local, 100% Tasmanian owned and operated family business that has been supplying customers with great tasting water for over 20 years. Kaoola spring water is collected in the Kaoota hills south of Hobart as it rises naturally to the surface from a deep aquifer in a man-fern rain forest setting. 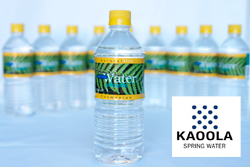 At Kaoola Spring Water we are so sure you will enjoy the taste and convenience of having our water on tap we offer a free, no obligation 4 week trail including a cooler of your choice.